Welcome to the Placer Area Reading Council’s website. It is our hopes that this site will provide resources and tools for building or enhancing your love for reading. Let u s know how we can make this site better. 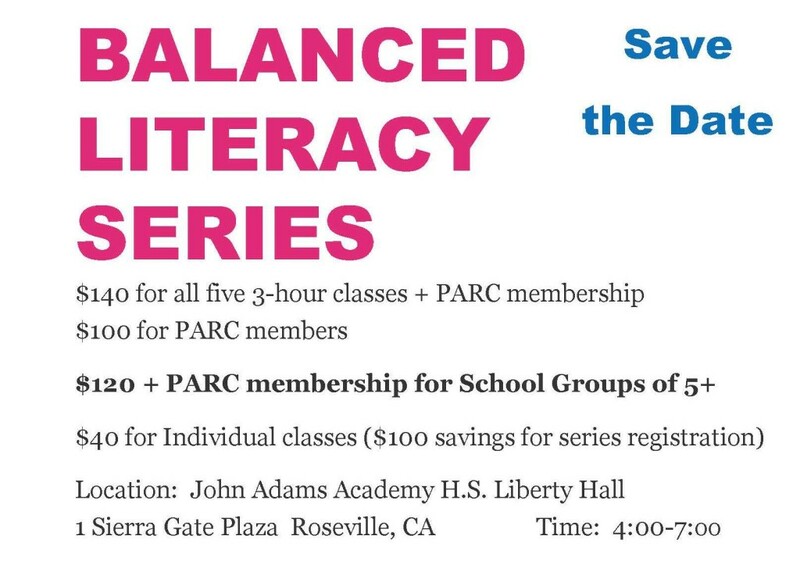 The Placer Area Reading Council (PARC) is a professional organization affiliated with the California Reading Association (CRA) and the International Reading Association (IRA). We are composed of teachers, administrators, parents, librarians, paraprofessionals, students, and others interested in promoting literacy. PARC seeks to foster the love of reading, and improve the teaching and writing at all educational levels by providing informative meetings and in-services; recognizing the efforts of local educators, students and community members; and promoting mutual understanding and cooperative efforts among teachers, administrators, parents, and the community. PARC would like to welcome Sue Schofield, a second grade teacher at John Adams Academy, to our Board. Sue will be acting in the capacity of Recording Secretary and will also help to organize and execute our events. We are thrilled to have Sue on board and thank her for her desire to help out so that PARC can continue to fulfill its Mission of “Spreading the Seeds of Literacy from the Valley to the Foothills”. PARC’s mission is ALWAYS to share information that empowers educators as reading teachers so that literacy instruction in our area can continually be enhanced. It was our pleasure and honor to present this event for those who were in attendance. Next month we are very pleased to be hosting an event featuring Lori Oczkus, a prolific author and national presenter and educational consultant. 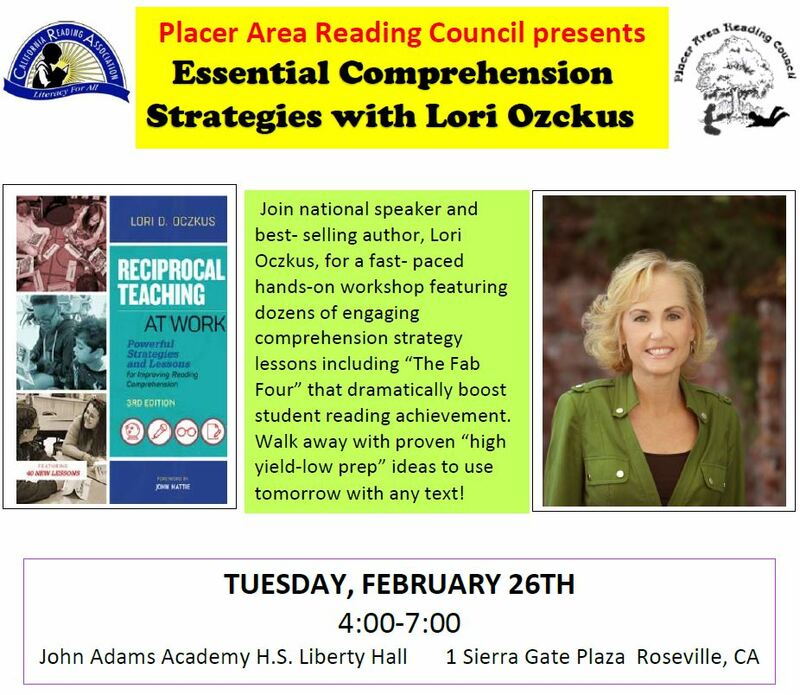 Lori will share a plethora of strategies designed to improve and increase comprehension among students. Her friendly approach to sharing ideas will instantly make those in attendance feel comfortable and the quality of her ideas will infuse participants with enthusiasm about their instruction. Please see the flyer on this site and plan on joining us! Students were active participants in Erin Dealey’s personal and interactive presentation on becoming an author. Parents, grandparents, siblings and teachers celebrated our young authors in a packed auditorium at John Adams High School. Face in a Book bookstore and the Roseville Library were on hand for book buying and information on book lending. Did you know teachers can check out entire STEM kits from the library? For many years Placer Area Reading Council has donated funds to support a library in a school for homeless children located near Johannesburg in South Africa. The photos show renovations being made due to some recent corporate donations. Cleaning, painting, new bathroom fixtures. A visit from Sister Mary (retired director), children in their new “Toms” shoes helping paint, and the busy school library. Check out the Facebook page for “Lerato Educational Centre”! Thanks to Rene Taylor for the articles and photos. Click on the photo above to read this interesting article. Click above to watch an interview/StorySmashup with Dav Pilkey & Jeff Kinney (Captain Underpants & Wimpy Kid books) They describe how they plan, and organize a book. 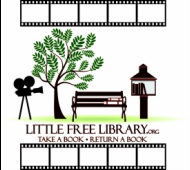 Promoting literacy and love of reading by building free book exchanges. Here’s a link for a copy of the hand outs from the CRA PDI. PARC Members and those interested in becoming members are welcome!